Today is Memorial Day. On this day, we remember those who have lost their lives while serving in the U.S. Armed Forces. Today, we honor their sacrifice. But despite the solemnity of the holiday, today also unofficially marks the beginning of summer and remains a typical American holiday: a day for sales and for barbeques. I don’t want to be a Debbie Downer here, but for those of you who plan to celebrate today, I urge you to take a minute to remember our fallen heroes, and if you plan on consuming alcohol: remember your tight junctions and claudin-1. Alcohol can really mess with your claudin-1… womp womp! Tight junctions (TJs) are the regions that join tight epithelial cells and regulate the transport of various molecules and ions through the epithelium. Claudins, along with occludins and E-cadherin (encoded by CDH1), are transmembrane proteins that are crucial for the formation and function of TJs. These proteins form “strands” that are embedded in the plasma membranes of both adjoining cells and are connected in the extracellular space. Tight junctions prevent the free movement of molecules and ions through the paracellular space and help maintain cell polarity (apical v. basolateral). From Wikipedia. Occludins were the first integral TJ proteins discovered. Careful screening of TJs from chicken liver revealed claudin-1 and claudin-21. This week’s gene, claudin-1 (CLDN1), is highly expressed in the liver and in skin of vertebrates. 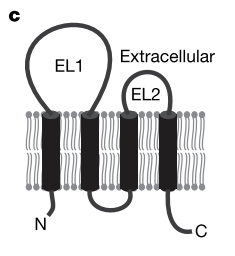 Claudin-1 has four transmembrane domains and two extracellular loops (EL1 and EL2). Claudin-1 is necessary for survival. Mice lacking the claudin-1 gene have a skin barrier deficit, which results in severe dehydration and early death2. People born with a claudin-1 mutation may develop a combo condition called “neonatal ichthyosis and sclerosing cholangitis” (NISCH = dry, scaly skin and inflammation of bile ducts) syndrome3. Increased paracellular permeability in NISCH patients causes toxic bile leakage, resulting in damage to liver cells (hepatocytes) and impaired bile flow (cholestasis)4. In addition to these TJ-related functions, some “non-canonical” functions of claudin-1 have recently been found5. For example, claudin-1 seems to be important for: cell proliferation, cell differentiation, cell motility and migration, call signaling, gene expression regulations, and anti-apoptotic functions. Although usually asymptomatic, hepatitis C virus (HCV) is the leading cause of cirrhosis and liver cancer worldwide. Claudin-1, along with several other proteins, is necessary for the entry of HCV into host cells6. Therefore, Claudin-1 is a target for anti-HCV drug development. HCV (black dots) can’t enter “naive” cells not expressing claudin-1 (CLDN1). While anti-HCV researchers are trying to suppress claudin-1 to keep HCV out of cells, other researchers are exploring the use of modified claudin-1 proteins (peptidomimetics) to get other substances into cells more easily7. Specifically, they would like to increase the permeability of the blood-nerve barrier for the application of analgesics for pain control. When a specific claudin-1-peptidomimetic is applied to a nerve, endogenous claudin-1 is internalized, opening the blood-nerve barrier, thus facilitating analgesia delivery. This is useful, but weakening TJs for HCV defense or analgesia delivery can be very scary and will need to be well-regulated. First, as in NISCH patients, the increased permeability of lung epithelium (“leaky gut”8 ) can cause bile leakage and damage to hepatocytes. Second, the skin barrier deficits similar to those in NISCH patients and claudin-1 deficient mice can occur, leaving your beautiful skin dry and scaly—untreatable with lotion9! Finally, increased lung permeability can increase the chance of aveolar flooding1011, which is scary. Increased lung permeability also increases the chances of developing pulmonary disease, acute respiratory distress syndrome, chronic bronchitis, and pneumonia. Claudin-1 has become increasingly popular in the past 6 months. Perhaps because more of its non-canonical functions are being discovered (Ref.5)? The April issue of Science featured an article on the structure of claudin-15 which may have sparked interest in the O.G. claudin. Have you searched for claudin-1 recently? Tell us why in the comments below! So, even though your claudin-1 might not be as fully at-risk today as my intro might suggest, it is still very important for your well-being and still very susceptible to damage from chronic alcohol use… So don’t forget it. Claudin-1 ain’t nuthing ta f’ wit.